Have you noticed a loved one is watching TV at an increasingly high volume, or struggles to hear when you’re speaking to them? Does your parent avoid crowded events or restaurants? Maybe they have a hard time tracking conversations? They are likely experiencing age-related hearing loss, one of the most common conditions affecting older and elderly adults. If left untreated, hearing loss can lead to isolation and depression if they feel embarrassment or shame at not being able to keep up with conversations. Addressing hearing loss and treating it before it gets worse can help your parent feel more secure, confident, and less alone. Another symptom of hearing loss is tinnitus, a nagging ringing or buzzing in the ears. Not only can tinnitus occur due to age-related hearing loss, but also loud noises, earwax blockage, or stiffening of the bones in your middle ear. Medical specialists categorize tinnitus into two categories: subjective tinnitus and objective tinnitus. Subjective tinnitus is the most common and the phantom noise in your ear—only you can hear it. Objective tinnitus is rare and caused by noise generated by structures near the ear. It can sometimes even be loud enough to be heard by a doctor during an examination. Tinnitus can develop as the result of other medical issues, like an upper respiratory condition. If it doesn’t go away within a week, has developed suddenly, or comes with immediate hearing loss and dizziness, call your physician immediately. Precautions can be taken to help prevent tinnitus, like using hearing protection if working in loud environments, and keeping volumes at a reasonable level when listening to music, especially through headphones. More than 200 medications can damage the ear and cause hearing loss, tinnitus, and balance disorders. These medications are considered ototoxic. While some symptoms will subside by discontinuing use of the drug, others cause permanent damage. Knowing which medications cause symptoms can save you a lot of frustration. Call your physician to discuss side effects or issues with hearing if one of your or your parent’s medications is on the list. We understand that speaking to someone with hearing loss can be frustrating but being sensitive to their needs is important for better communication. Find out how they prefer to communicate, and make sure you have their attention before you start to speak. Try to keep background noises to a minimum so your voice is as clear as possible. Make sure you are face-to-face, in a well-lit room, and they can read your lips. Speak slowly, clearly, and toward their dominant ear. Most importantly, practice patience! Your loved one may not understand what you’ve said the first time or mishear. Speak in full sentences and rephrase questions if they have difficulty understanding. Take advantage of digital communications if they’re savvy to email and text—you may be able to avoid frustrations all together through written word. Hearing loss affects the part of your brain that processes auditory information. When a person can no longer hear, the structure of the brain changes, which could lead to the effects of Alzheimer’s disease. Everyday conversations suddenly require a lot more mental energy when a person’s hearing goes. They must mentally work harder to understand what people are saying to them, resulting in a loss of energy toward other cognitive functions, like memory. 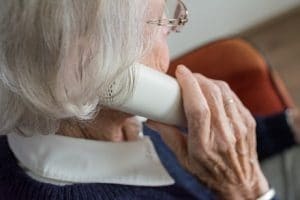 Just as seniors isolate themselves out of embarrassment when they begin to develop dementia symptoms, those with hearing loss may find it more difficult to maintain social connections as their hearing gets worse. Social isolation and loneliness have been known to expedite the development of symptoms for dementia. Often people mistake hearing loss in elderly people with signs of dementia. Identifying hearing loss and correcting any condition found may eliminate those symptoms. There are several types of hearing aids available that improve hearing by amplifying soft sounds. While they can’t restore normal hearing and take time to get used to, they help the user maintain some autonomy and participate in things they love. The type of hearing aid a person needs is based on their level of loss. As technologyadvances, so do the function of these devices. Many offer noise reduction options, Bluetooth connectivity, direct audio input, remote controls, programmed settings for various situations, environmental noise control and synchronization between two aids if both ears require help. If you or a loved one are experiencing symptoms of hearing loss and think a hearing aid would be beneficial, talk to your primary physician and have them refer you to the right ear doctor. Ear doctor can mean several things: an ENT (ear, nose, and throat specialist, otologist (a highly trained physician or surgeon dealing specifically with ear related illness and injury), or an audiologist (evaluates individuals for hearing loss and balance issues). The examiner will assess your hearing and help you choose the right device for the hearing loss you have. You may be able to request a trial period with your hearing aid to ensure it’s the right device for you. Some insurance policies cover part (if not all) of the expense of hearing aids, but it’s wise to budget for $1,500 or more. They are costly but hearing aids could significantly improve the quality of life for you or a loved one. Hearing loss may leave your loved one feeling frustrated, vulnerable, or unsafe living on their own. At Aegis Living, we can help! Our dedicated staff is trained to handle sensitive issues such as hearing loss with compassion and care. Call your nearest Aegis Livingcommunity to set up a tour.